The exploitation of mineral deposits always creates debates around economic necessity versus environmental preservation. Fracking for gas in the Karoo region of South Africa is currently vigorously debated. This article is not about fracking, but it does touch on aspects of gas retention or loss in the Karoo rocks. It also highlights the potential for other mineral deposits in the same area. The Drakensberg dominate the mountainous country of Lesotho in southern Africa, and are composed entirely of basaltic lavas (like Hawaii). The eruption of these lavas ended a protracted period of accumulation of sedimentary material from 300 to 180 million years ago – sand (now yellow sandstone), clay (now blue-black shale) and organic material, the latter producing South Africa's extensive coal deposits, no oil, but possibly gas accumulations. The total thicknesses of these sedimentary layers and lava flows probably reached 6 km and 2 km respectively. These sedimentary layers and lavas covered much of Gondwana, the ancient mega-continent of Africa, South America, India, Australia and Antarctica that split and drifted apart due to the forces of volcanic eruptions 180 million years ago. Associated with the vast outpouring of lava there was a huge deep plumbing system of molten rock, called magma. Magmas originated by melting at depths of 100 km inside the Earth, and infiltrated their way upward to surface. Any joints, cracks or weaknesses in the Earth's crust would have been exploited by invading magma. The sedimentary rocks are like piles of pancakes – very thin layers with definite parting surfaces in between. The magma invading upward injected horizontally along these parting surfaces, for tens to even a hundred km. As the magma cooled it produced a hard, black rock (not unlike the basalt lavas) that is called dolerite. Where the magma invaded a horizontal bedding plane we call it a sill. Being much harder than the under- and over-lying sandstones and shales, these dolerite sills form the flat-topped hills so distinctive of the Karoo scenery in South Africa. Studies have shown that the Karoo succession contains about 10% of its thickness as dolerite sills with an average individual sill thickness of 30m. Where the magma solidified in a steep fracture we call it a dyke. Two very different potentially economically important aspects of these sills are worthy of explanation. The first relates to gas preservation. 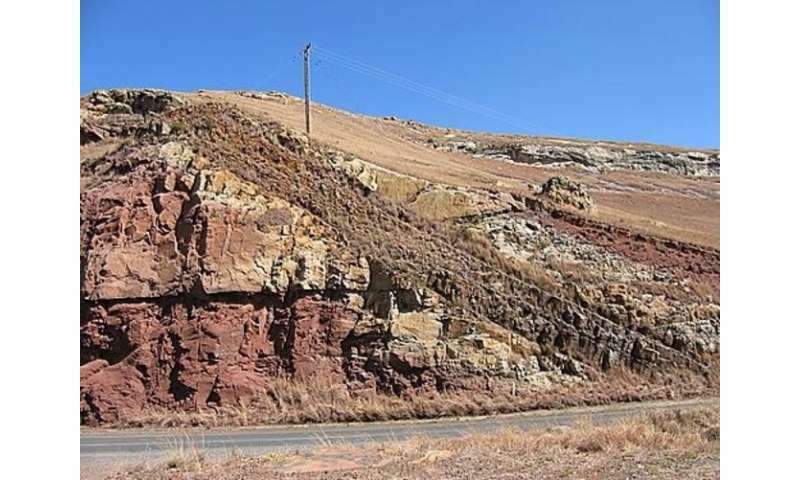 Many analogies have been drawn between the gas-bearing shales in sedimentary formations around the world with the Karoo rocks in South Africa and the well-known issues about economics versus environment are vigorously debated. However, the Karoo is the only example that has abundant dolerite sills. There are two potentially opposing effects of the dolerite sills. Gas formed from decomposing organic plant material that was buried under thick layers of sand and clay. Gas would normally leak upward very slowly through small pores and spaces in the rocks until it was trapped beneath a layer of rock that has no pores. We call that layer impermeable. The dolerite sills form such impermeable layers and so may have acted as good trap rocks for the gas. Thus the rocks beneath a dolerite sill might provide a good exploration target. But there is also an opposing process. The magma intruded at 1200 degrees Celsius. As it cooled it heated the surrounding rocks. The width of this heating zone depended on the thickness of the dolerite sill. The highest temperature at which gas can survive is about 250 degrees Celsius, above that temperature it will be burnt. That temperature will be exceeded for all the surrounding rocks that are within half the thickness of the dolerite itself (both above and below). Any gas present in the sedimentary rocks at 180 million years ago within that distance of the sill would have been destroyed. Thus, a 30m-thick sill would burn all the gas within 15m above and below. At a number of surface localities the sedimentary rocks have been found to display a very unusual structure. The rocks have been broken and re-cemented, and extensively altered. These features have been attributed to the release of high temperature fluids and gases from depth. Are they evidence that the intrusion of the dolerites liberated gases that streamed upward? If so, there may be less gas than anticipated. So we do not know what to expect the effect of the dolerite might be in terms of gas preservation. The second potential economic aspect relates to nickel-copper sulphide mineralisation. A considerable proportion of the World's nickel is mined from dolerites. The best example is in Siberia, Russia. In South Africa there was one small mine for nickel-copper sulphide mineralisation at Insizwa, near Kokstad, in KwaZulu-Natal. The intrusion is 1000m thick. Although negligible amounts of ore were ever mined, there is chemical evidence that much larger deposits ought to occur at its base. The logic is that if an immiscible sulphur-rich liquid separated from the magma (like oil separating from water, or grease droplets forming on a cooling bowl of washing-up water) a considerable proportion of the nickel and copper would be extracted into the sulphide liquid, which then forms an ore deposit. The remaining magma would then be depleted in nickel and copper compared to its original composition. Based on the difference between "normal" basalt and the Insizwa rocks it is possible to calculate that enormous masses of nickel-copper-rich sulphide ought to be hidden below the intrusion. I know of four other dolerite intrusions in the Karoo that have this characteristic nickel-copper depletion with the implication that they too could host valuable metal resources at their bases. Would their exploration and beneficiation create national opposition analogous to that generated around fracking?